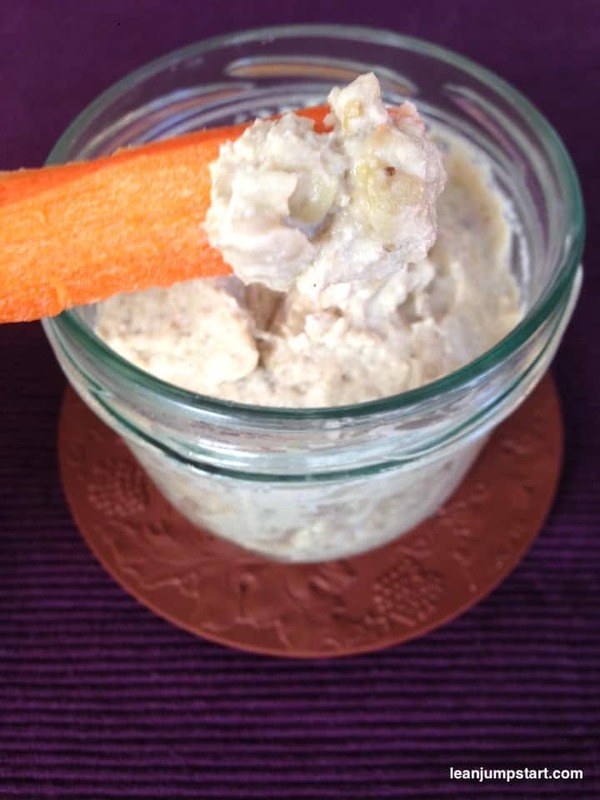 If you like middle-eastern appetizer like hummus then you will also love this super easy baba ganoush recipe. The gluten free eggplant puree is a healthy dip or spread that is also very popular at any party. All you have to do is serve some bread, vegetable sticks, or pita chips for a delicious finger food. The aubergine dip is also ideal for lunch or dinner, because you can easily make it and customize it with the right spices or toppings. Do you know the situation? You buy a crunchy, rich purple eggplant. You see it in your delicious stuffed, oven baked eggplant dish or a colorful ratatouille and then – forget it in the vegetable drawer of your fridge. By the time you remember it again, it is already slightly wrinkled, has lost its shine and no longer looks very appealing. My favorite Baba Ghanoush recipe is just the thing for this eggplant, because it makes it look best once again: as eggplant paste that tastes smoky, creamy and just awesome! 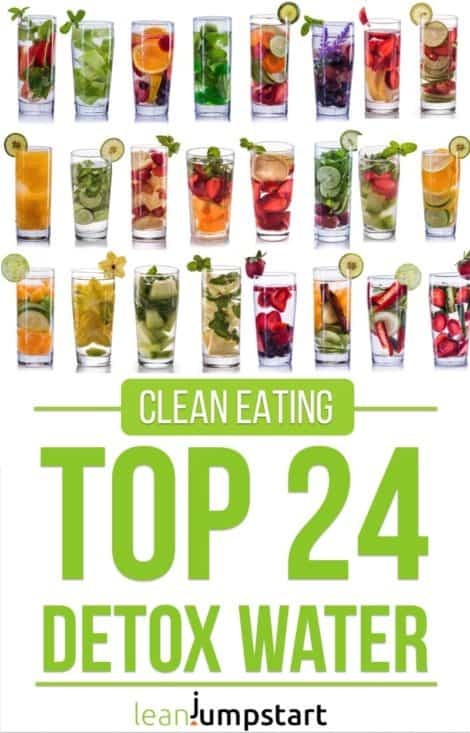 Although it’s a simple clean eating recipe you have still invest some preparation time, but I promise you – it is worth it! If I wouldn’t prepare baba ghanoush because of its great taste, I would do it just because of the awesome name. And that in spite of the fact that baba ghanoush is not one of those dishes that turn you on visually. You have to have confidence in the greyish-yellowish puree before it embraces you with its wonderful taste. After cooking, the meat from the eggplant must be so soft that it can be easily scraped out of its skin and simply peels off. Only then most of the bitter substances have faded away. The flesh is then soft and fluffy and can easily be whisked into a puree with a fork. The idea of cooking aubergines until their structure is completely dissolved and then processing them into a paste with light acidity, garlic and spices is simply ingenious. The taste full-bodied and fresh, the texture is velvety soft, at minimal preparation work. How to make baba ganoush? Variations of the recipe often include fresh herbs, different nut pastes, pomegranate seeds, pine nuts, green peas, or a little yoghurt. 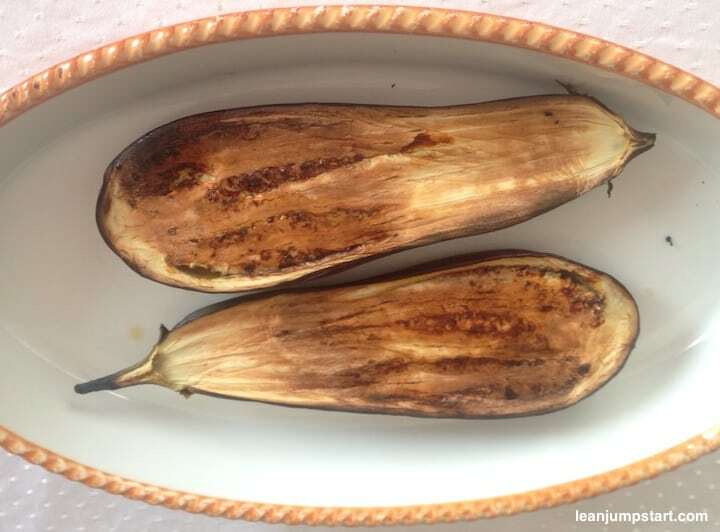 By far the best way to get the intense smoky flavor the dish demands is blackening the aubergine over an open flame. As I don’t have an open flame and also don’t grill in March I’ve baked them instead in my oven. For us the eggplant dip still tastes delicious and is probably healthier than the roasted version which can release harmful free radicals. If you however wish an extra smoky taste you could season the dip with some roasted paprika spice. For my easy method you just cut the eggplants in half and place them with the cuts facing down into a fireproof baking sheet or dish. Pin eggplant with a fork several times. For some people drizzling with olive oil is a must, but I skip this step for a leaner version. Cook for 45-60 minutes at 230 C°/446 F° top and bottom heat until the skin is wrinkled and black. If you have very small veggies, 30 minutes might work too. Remove from the oven and allow to cool briefly. As soon as it’s cool enough to handle, scrape the flesh out of the skin with a spoon. Place it in your food processor, add the tahini, all other ingredients and let the magic happen. Of course you can also just use your fork for whisking. 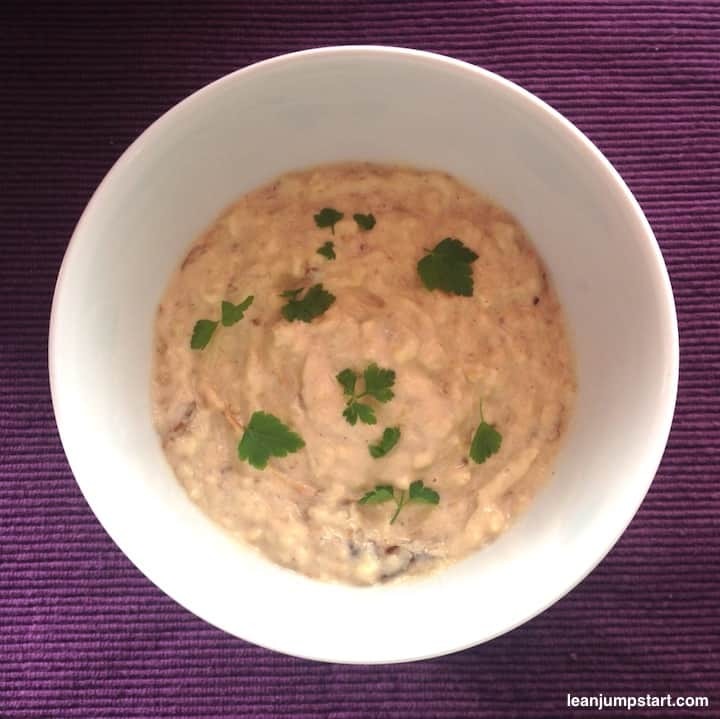 The following is one of my best loved baba ganoush recipes – as it is simple and always successful. As we are huge baba ganoush fans I often use two aubergines and double ingredients. Place them with the cuts facing down into a fireproof baking dish. Pin vegetable with a fork several times. Preheat oven at at 230 C°/446 F°. Bake for 45-60 minutes at the top of the oven until the skin is wrinkled and black. After slightly cooling down scrape out flesh using a spoon. Place roasted eggplant flesh, tahini, garlic, lemon juice, olive oil (optional) and a pinch of sea salt in a food processor. If you prefer a bit more texture you can mash the ingredients with a fork instead. 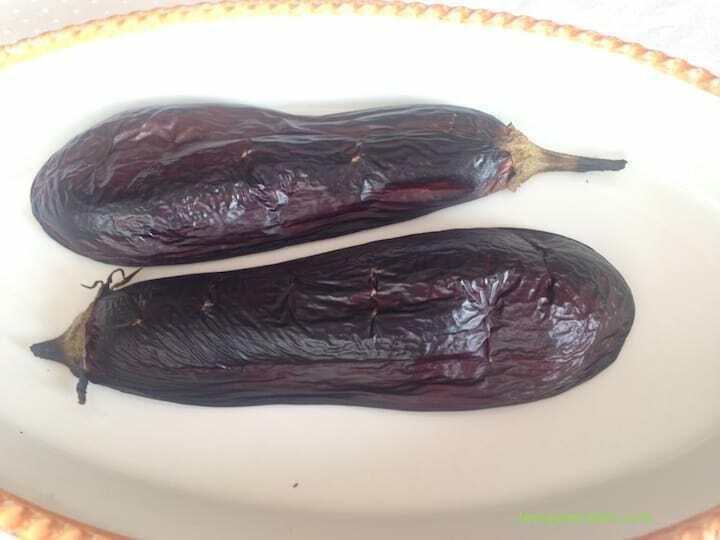 Fill the eggplant paste into a jar and store in the refrigerator for a week minimum. 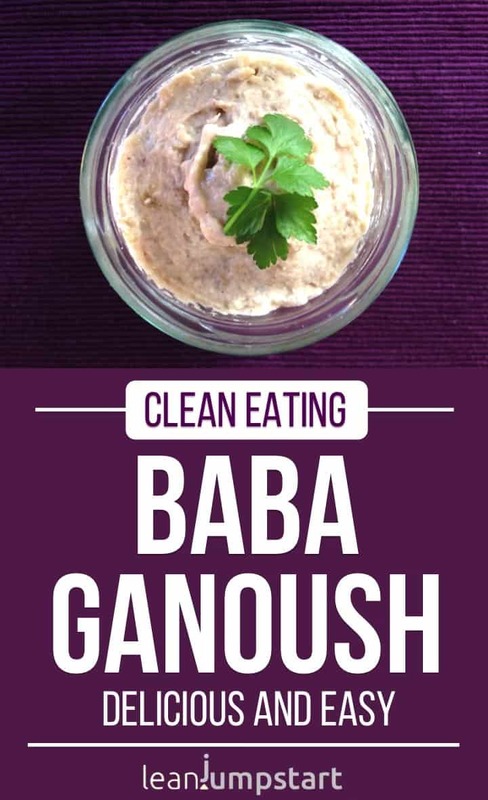 Maybe you ask yourself “what is baba ganoush meaning?” It appears also as “baba ghanouj”. The Arabic “bābā” means “father”, while “ghannūj” might be a personal name. I’ve also found the very poetic translation from Arabic: ‘the darling of her father’. So beautiful! The simple recipe I’ve presented to you is a skinny version for weight management with little but healthy fat from a bit of olive oil (optional) and the fiber rich sesame paste. You’ll find however many other oriental recipes that call for much more olive oil although I don’t think it is necessary for a great taste experience. Hummus is slightly related to Baba Ghanoush. Both use sesame paste. Hummus, however, consists of chickpeas instead of eggplants and is therefore higher in protein and fiber. In addition, hummus also contains curry spices. Can you freeze baba ganoush? Great news, baba ganoush can be frozen for 4 months! The lemon juice in the aubergine dip preserves color, neutralizes the tannic bitterness. Since it already has a mashed or pureed texture, you won’t notice a change in its consistency after thawing. Tipp: To minimize the formation of ice crystals it helps to strain the baba ghanoush before freezing. I love baba ganoush so much! The boyfriend and I were just talking about it (after eating it in one of our favorite restaurants) and decided I needed to make it. Perfect timing! Thank you Danielle. I’m happy that my recipe inspiration comes just in time and you can replicate at home your positive restaurant experience with it. Probably you will even top it. Enjoy! 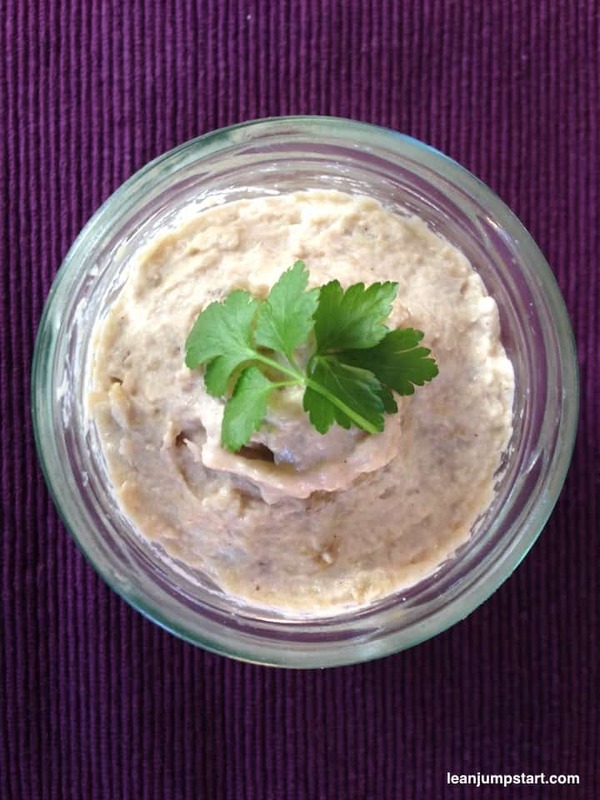 Baba Ghanoush is an amazing dish. It looks so creamy and really simple to make. Will definitely try it. Yes, you should not hesitate to try it Veena. If you love creamy dips then this recipe will be a keeper for you. I can’t believe I’ve never made baba ganoush before! This looks like the perfect healthy recipe! Each region in the world has its own yummy plant based recipes which happen to be healthy too. So there is still lots to discover for us, Cliona. The more we travel the world, the more often we stumble over amazing recipe inspirations. I am dying to make this already! I love eggplant. In fact we eat a lot of it here in Italy! However, dips are not an Italian thing but I love them! I’ve had this in Turkey and maybe something similar in Greece. Going to pin for later! Sounds great, Jaqueline. Italy is know for growing these fascinating nightshade vegetables. If you don’t eat it this delicacy as dip you can always use it as tasty sandwich spread. I tried Baba ganoush when i was in Turkey a few years ago and i loved it so much, This recipe sounds delicious need to try it! Thank you Nathan. That’s one reason why I love to travel. You get to know all those different cultures, customs and culinary highlights. Especially Turkey is an epicenter for this garlicky eggplant cream.